This simple 4 ingredient Easy Cucumber Salad is a great accompaniment to almost any meal. It requires only 4 ingredients, and is delicious right away, unlike some cucumber salad recipes that require a waiting time. This is one of my go-to salads when I need to add vegetables to a meal because I almost always have onions in the house, and I frequently pick up a cucumbers and tomatoes during my weekly trips to the grocery store or farmers market. This salad always makes me think of my paternal grandparents farm. When I would visit them during the summer, mid-day and evening meals were almost always accompanied by a plate filled with slices of onions, cucumbers, and tomatoes. 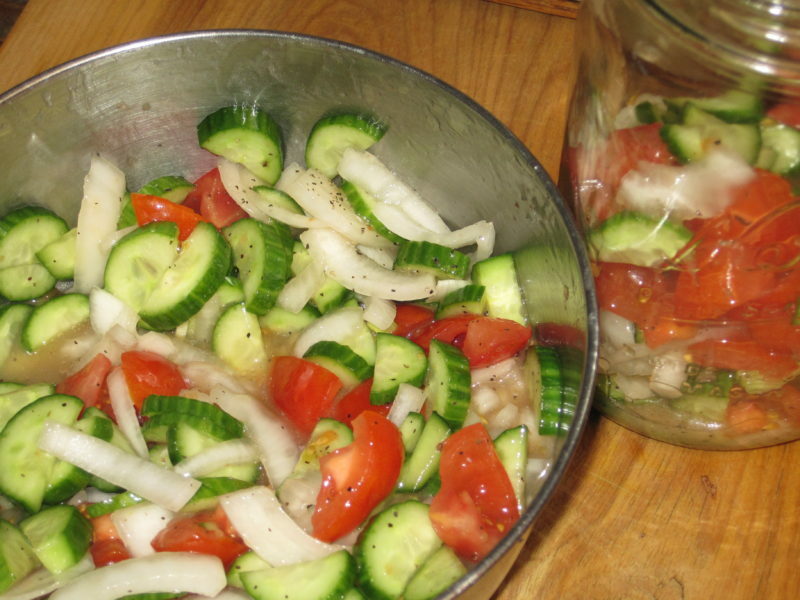 As a child, I didn’t have much interest in the onions, but I ate cucumbers and tomatoes greedily. On occasion, the variety of cucumbers planted in the garden were bitter. On those occasions, my grandmother would create a salad of cucumbers and onions in a vinegar brine which was served with our meals. The vinegar brine removed, or masked, the bitter taste. She never included tomatoes in this salad, but they were always sliced and on the table. Because of that, I always think that the two vegetables belong together. Now that I’m the adult, and my grandparents have passed away, I still associate the combination of cucumbers, onions, and tomatoes with them. My problem is that Baker’s Man isn’t a big fan of a plate full of sliced fruit and vegetables, and, sometimes, I’m really lazy tired after a long day at work, and I don’t feel like mixing up that vinegar brine. Baker’s Man also is not a big fan of vinegar. As a result, I have experimented with an assortment of bottled salad dressings. My favorite dressing to use for this recipe is Zesty Italian. I’m not loyal to any particular brand. I generally buy the least expensive one, and I have even been known to use the fat free version. It doesn’t seem to matter. All you have to do is cut up your cucumbers, onions, and tomatoes and toss them with Zesty Italian Dressing. It’s that easy. 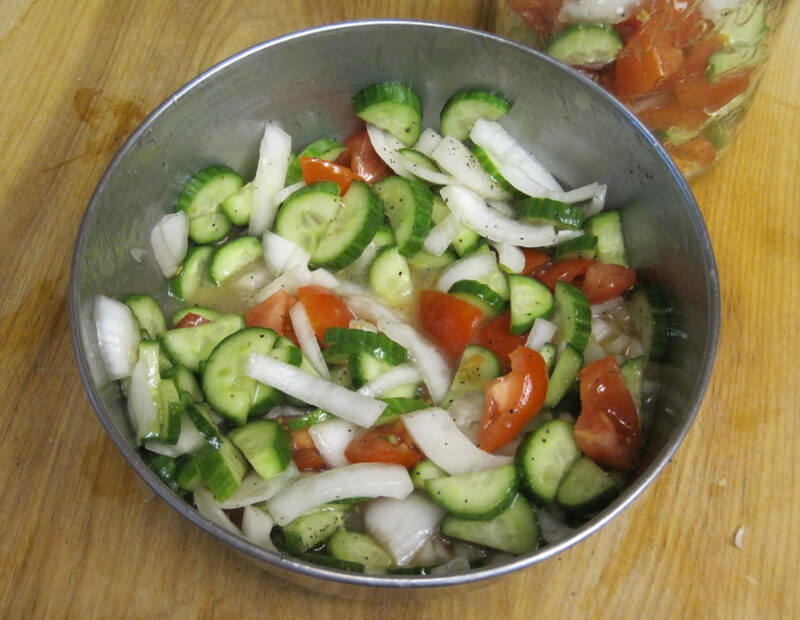 Give this Easy Cucumber Salad recipe a try and let us know what you think. It’s delicious, and we know you’ll love it, too. This simple combination of cucumber, tomato, and onion tossed in a zesty Italian dressing makes the perfect salad to accompany your meals. Chef's Note: It is possible to substitute fat free Zesty Italian Dressing to decrease fat and calories without sacrificing any taste. 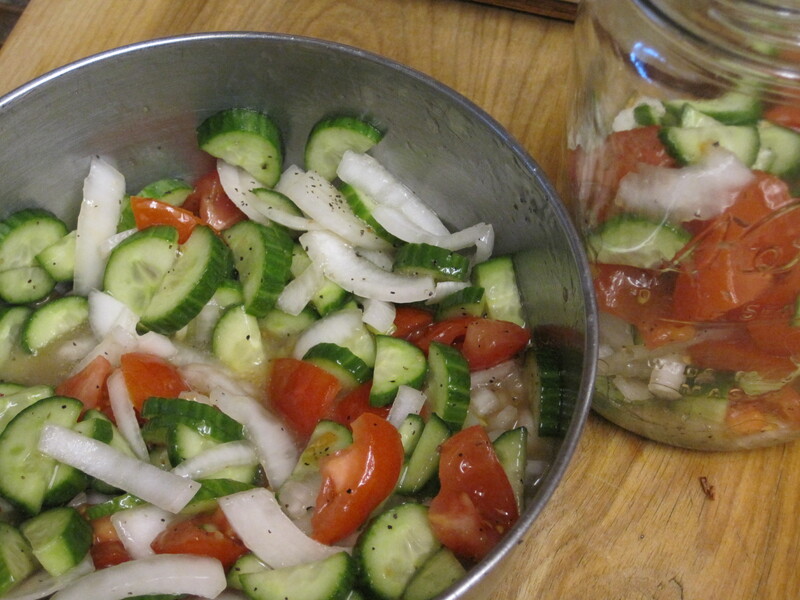 Place cucumbers, onion, and tomatoes in a serving dish. Pour dressing over vegetables and toss well. Serve immediately or allow to sit in the refrigerator for 30 minutes. I have made this a day ahead, but the cucumbers release liquid and the dressing is diluted which affects taste. The following nutritional information is for the recipe prepared with fat free dressing.